Let’s try a few more, shall we? “Males meet at 8 am and Females meet at 10 am”. “Traditional Service at 8:00 am; Contemporary Service at 10:00 am”. Bear with me if this has already got your temperature to rise a bit and that Harvard Lawyer in your mind is belting out defenses. Psalm 90 was written by Moses, 400 years before David wrote Psalm 103. In David’s time, (about year 1,000 B.C), Psalm 90 would be considered a classic hymn by that generations’ standards. But Psalm 103 for example, would be a contemporary song. And clearly by reading the words and the meter of each different psalm, respectively, we would probably expect to hear a difference in how each particular song was played; one more slow and meditative, the other more enthusiastic and faster. Furthermore, Revelation 5:9 says that one day all the people of God will sing a “new song” – in the Resurrection! I hope that the “traditional/classical” minded of the Church won’t sit out on that. And I hope that the “contemporary/modern” leaning won’t sit out when the Baldwin-Bach-Beethoven pipe organs belt out, “Hallelujah! Salvation and glory and power belong to our God, for his judgments are true and just; for he has judged the great prostitute who corrupted the earth with her immorality, and has avenged on her the blood of his servants” (Rev. 19:1-2). What we see from scripture (not the church-growth gurus), is that when the church gathers to sing, it should sing a variety of songs that have a different sound, style, and genre (by God’s grace at our church, we use a few organ settings, piano, acoustic guitar, mandolin, flute, violin, banjo, bongo and conga drums, and percussion box; we use the best of the classics and the best of modern songs with every kind of sound possible, at least to our meager musical abilities, and never, never, never split up our congregation over music preferences). Even if we don’t exactly agree on what a psalm, hymn, or spiritual song sounds like, we must agree with the scriptures that there is to be a variety of different songs and sounds in worship. The “one another” of the scriptures means that older people who might prefer the classics need to learn to appreciate/sing with the younger generation; likewise, the younger, more contemporary leaning in the church need to learn to appreciate/sing with the older generation. This also means that a church should not get trapped in a southern-gospel sound where every song feels like a high-school football pep rally on a Friday afternoon in the gymnasium. Or, where every song feels and sounds like you’re attending a black-and-white tie and gown to hear the best orchestra in the state. Or, where every song feels like you’re attending a quiet meditation where minor keys and thoughtful eyes gaze at the floor. Worship should incorporate all of this! The lyrics are to reflect what scripture teaches. There should be variety of style and sound in the songs. The songs are to be sung to God who sent his son Jesus Christ. The songs are to be sung to other believers in Christ. The songs are for all people groups in Christ throughout the ages. All the songs are for all lovers of Jesus Christ, not just for a particular sub-group within the church. 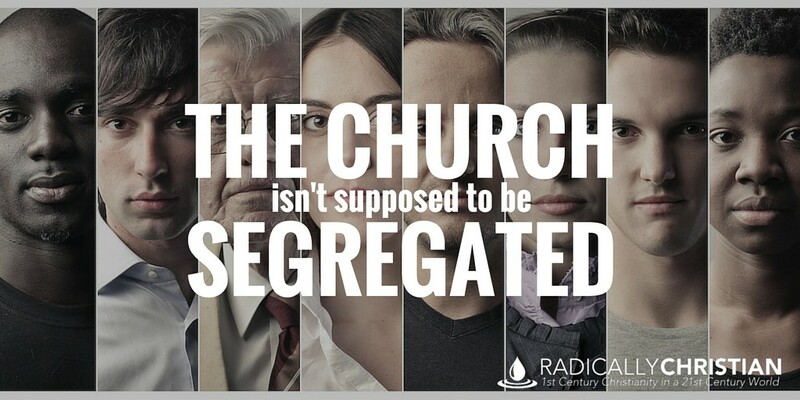 The Church is not to be segregated in its worship over ethnicity, gender differences, cultural differences, vocation/economic differences, food preferences, or music preferences. When a local congregation is divided and meets at different times over any kind of personal preference, then the gospel to all people groups, in all times, places, and circumstances, is dishonored in the church and implies that Jesus can be restructured to fit ones’ personal taste. You can’t cut and dice Jesus to suit you. Rather, He binds and heals the divisive, segregated, and “my preferred musical experience” minded folk, to join him in multi-sound-surround worship at his Throne. That’s where this is all headed – whether you prefer it or not. I hope you do! This entry was posted in Uncategorized and tagged Congregational Worship, Desegregation of Worship, Philosophy of Worship by ivanjamestruman. Bookmark the permalink. I heartily agree with this. Having been a part of a number of churches, the most fruitful worship has been with a blend of musical styles. Each church that narrowed it’s selections to a single style have caused serious issues for the services. It wasn’t just that people’s preferences were either pandered to or ignored; but people stopped singing and went into being-entertained-mode, and many had to stop attending because of the painful volume and harshness of the pitches & cymbol noise (not just older folks by the way). And stodgy hymns that are chosen only for the lyrics but have poorly-written music have brought the worship mood to a halt. The church I grew up in later divided into separate traditional and contemporary services, and it split the congregation and the young people didn’t interact much with the older folks (an experience I value from my childhood that taught me to love those different than myself). I treasure my experience at GCC with the variety that we played and the closeness of the people, and hope that it continues. I think of that time often, especially now that we are now attending a small Orthodox Presbyterian church that is mostly traditional but welcomes a variety of music with focus on worship together. (I’m even learning to play the organ, and all ages say they are enjoying hearing it again!) I think most people (even young people) are looking for a God-centered worship time that transcends fads and entertainment, so that they can feel the security of God’s timeless love and grace. Hi Sandy. Thanks for the response. I have not played a real organ with all the full left side stops and bass foot keyboard since 1992, air pushed, 10 ft brass pipes. Wow what a sound!